When Chinese Premier Wen Jiabao announced this year’s annual growth target of 7.5 percent in March, most analysts dismissed it as false modesty: The Chinese economy has consistently outperformed annual targets over the past decade, averaging close to 11 percent growth, despite the 2008–2009 global financial crisis. But with activity cooling much more than expected in recent months, the 7.5 percent target is starting to look ambitious. China’s economy grew 7.4 percent in the third quarter of 2012, the seventh consecutive quarter of decelerating growth, as demand for Chinese goods and services at home and abroad slackened. If this trend continues, full-year growth is on course for its weakest showing since 1999. The government had hoped that increasing exports would help bolster the economy despite flagging domestic demand. Instead, exports are at risk of becoming a drag on the economy after slumping to just 1 percent annual growth in July 2012, from 11.3 percent in June. Although the U.S. trade deficit in goods with China fell in 2009 as a result of the global recession, it has since surged, reaching a record high of $295.4 billion in 2011, up from $273.1 billion in 2010. For the first eight months of 2012, the United States exported $69.9 billion worth of goods to China and imported $273.1 billion from China, for a deficit of $203.1 billion. The deficit in goods with China is by far the largest among U.S. trading partners and 40.6 percent of the total in 2011. Currency appreciation leveled out in 2012: The renminbi (RMB) did not appreciate as much as in 2011, and there are even signs that the Chinese government may devalue the RMB to boost exports. Rebalancing China’s economy to one less dependent on exports and more focused on meeting the need of China’s consumers was declared a top priority by the governments of the United States and China. As Under Secretary of the Treasury Lael Brainard stated in July, rebalancing is imperative for China to avoid the ‘‘middle- income trap’’ and to navigate its demographic transition to a society of fewer workers and more retirees. However, under the pressure of declining growth, China is backsliding to continue its overreliance on fixed investment and government spending to power growth. Despite three decades of economic reform, state-owned and statecontrolled enterprises still account for as much as half of the Chinese economy. Their political influence within China and their ability to compete on a global scale are both on the rise, and China’s industrial policy envisions an ever larger role for the state sector, particularly in support of China’s exports and overseas investments. Government corporations provide the means for the central government to designate and control important segments of the economy. At the same time, the government employs its corporations to advance its foreign policy objectives and international commercial interests. Many, if not all, of the corporate officials chosen by the Chinese Communist Party (CCP) Central Organization Department are party members, and many of them become part of a revolving managerial class that cycles through the hierarchy of China’s largest state-owned enterprises (SOEs). All the 130 leaders of the largest state-owned companies in 2011 were CCP members. In addition, 20 SOE executives served in 2010 on the CCP’s Central Committee, which elects the ruling Politburo. The existence of state-owned and state-controlled enterprises presents numerous challenges to U.S. corporate competitors in three distinct venues: within China, within the United States, and in third-country markets. Because SOEs are the preferred supplier for all levels of government in China, U.S. companies face a variety of discriminatory barriers to sales there. The same subsidies and preferences enjoyed by the state sector in China when competing with foreign companies in China also make Chinese SOEs stronger competitors in the U.S. market and third-country markets. The year 2011 marked the 28th straight year in which the United States has registered a trade deficit with China. 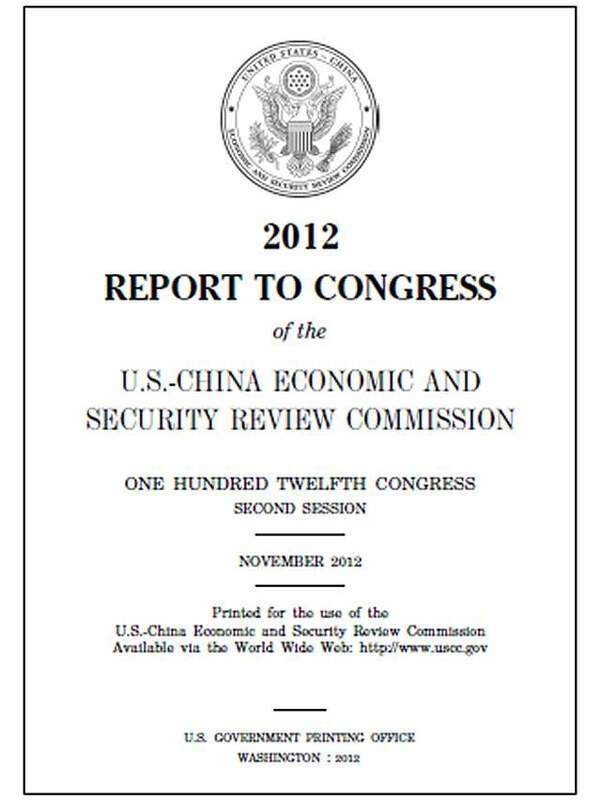 China’s state-directed financial system and export-driven growth model; its market barriers to various U.S. exports; its discriminatory policies that favor domestic companies over foreign investors in China’s market; rampant Chinese theft of intellectual property; and China’s unreliable rule of law, as well as its inconsistent adherence to World Trade Organization (WTO) commitments, continue to disadvantage American competitors. There is a growing consensus among economists and many international trade experts that long-standing methods of measuring bilateral trade relations are inadequate for the contemporary realities of global production chains and are distorting our understanding of bilateral trade balances. In practice, initial economic studies suggest that the U.S.’s trade deficit with China may be overestimated by the traditional standard measurements for determining bilateral trade balances. These measurements, which calculate the gross values of goods flowing between two countries, may be obscuring key details for devising more effective trade enforcement policies. Though they are often discussed as distinct and separate issues, the challenges of trade and investment that impact U.S. interests at home and abroad all stem from China’s macroeconomic policies. Improved understanding of the U.S.-China bilateral trade balance and the forces that shape it could be beneficial to policymakers faced with managing the relationship. However, resolving the many intractable trade issues that burden the U.S.-China relationship will remain a challenge for the U.S. government regardless of international improvements in the collection of trade data. • In 2011, the U.S. deficit with China reached $295.4 billion, up 8 percent from the previous year. For the first eight months of 2012, the United States exported $69.9 billion worth of goods to China and imported $273.1 billion from China, for a deficit of $203.1 billion. • Chinese growth in the first half of 2012 slowed significantly from the double-digit averages of the previous decade. Export growth has also slackened dramatically, mostly as a consequence of weak demand for Chinese goods from its two main trade partners, the United States and Europe. • As a consequence of domestic economic weakness, Chinese rebalancing policies appear to have been put on hold. As originally intended, rebalancing would have entailed restructuring domestic growth from export- to consumption-driven, reducing fixed investment, and allowing the RMB to appreciate. • Instead, fearful of a protracted slowdown, the Chinese government has introduced a set of growth-boosting policies, such as encouraging banks to lend and rolling out new infrastructure projects. These policies, though much more moderate in scope, echo the massive stimulus undertaken by the Chinese government in 2008–2009 in the wake of the global financial crisis, which at the time shored up Chinese growth but exacerbated the economy’s imbalances. • China’s adherence to the WTO principles and its Protocol of Accession remains spotty. Most recently, the U.S. Trade Representative has engaged China over its practice of using investigations and trade remedy actions in retaliation for challenges brought by the United States and not based on actual evidence. • State-owned and state-controlled companies in China provide the opportunity for the central government to implement its industrial policy, create global competitors, and develop monopoly industries for the benefit of the government. The government does so at the expense of foreign competitors. • Beijing reversed a 30-year process of economic reform of stateowned enterprises during the 2008 global financial crisis. A massive, $585 billion economic stimulus was directed by the government through state-owned banks to many state-owned companies, particularly in the metals, mining, and construction industries. As a result of the financial infusion, the state sector grew and became more influential within China. A resurgent Chinese state sector, armed with extensive government subsidies, competes unfairly with domestic Chinese firms and with China-based affiliates of American companies. • The largest Chinese state-owned enterprises are generally managed by the Chinese central government through a holding company that answers directly to the State Council. The top leaders of 121 centrally owned, nonfinancial SOEs are chosen by a branch of the Chinese Communist Party and are typically party members. In turn, the SOEs influence government and party decisions on the economy. In addition to SOEs owned by the central government, there were 114,500 SOEs owned by provincial or local governments, according to a 2011 estimate by the World Bank. • The banking system in China is almost entirely state owned and is dominated by five banks that account for nearly all lending. SOEs are the principal borrowers, while entrepreneurs and private companies find it hard to obtain loans even at higher rates. The country has an underdeveloped bond and equity market, putting private Chinese companies and foreign affiliates of U.S. companies at a further disadvantage. The rate of interest payments to depositors is set by the government at an artificially low rate, allowing the government to provide low loan rates to its favored clients in the state sector. This system of ‘‘financial repression’’ represents a transfer of wealth from the private sector to the state sector. • Even those companies that are majority privately held are likely to be influenced or controlled by the government. Private Chinese companies are expected to follow the guidelines of the government, which are spelled out in Five-Year Plans and other official planning documents issued by the State Councils and implemented by various ministries. • U.S. companies face unfair competition from Chinese SOEs within China, within the United States, and in third-country markets. Governments at all levels in China favor Chinese SOEs in procurement contracts. Chinese affiliates operating abroad do so with preferential financing from the government in China. • Governments at all levels in the United States seek investment from China. But investment from Chinese SOEs carries a number of risks to U.S.-based competitors due to the preferential financing that Chinese governments provide. U.S. laws and regulations are inadequate to address the advantages given to Chinese SOEs operating in America. Although Chinese investment into the United States is low, China has large dollar holdings that could be converted into direct investment in the United States. • When China joined the WTO in 2001, the government committed to economic reforms that included diminishing the role that the state plays in the economy. China has not complied with many of these explicit obligations. The United States has a variety of remedies to use to counter China’s failures to comply. They include bringing WTO complaints and antidumping and countervailing duty cases against the Chinese government and against Chinese industries. The Securities and Exchange Commission could issue regulations calling for enhanced disclosure by Chinese state-owned companies listed on U.S. exchanges of the subsidies given to the Chinese SOEs. The U.S. government could demand reciprocal treatment for foreign investment in China to match the treatment afforded by Chinese companies in America. Many U.S. firms are restricted to minority ownership of joint ventures in China or excluded entirely from some business sectors, while no such restrictions on Chinese companies exist in the United States. In some cases, reciprocal treatment is called for. The U.S. government could also exclude Chinese products and services from U.S. and state government services contracts and government construction projects until China opens its own government and SOE contracts to competitive bidding from American companies. • China’s indigenous innovation policies and additional attention to certain strategic sectors identified in its 12th Five-Year Plan ensure that it will continue to provide support to national champions. For the foreseeable future, such companies will continue to be favored over foreign firms for government and state-owned enterprise procurement contracts and will continue to benefit from a range of subsidies, tax breaks, special development funds, increased credit support, and other assistance not enjoyed by their foreign competitors. These advantages continue to make Chinese national champions formidable competitors in China and in other markets globally, undermining U.S. industry innovation and success. • Inconsistencies in central and subnational laws, practices, and enforcement efforts, particularly in the realm of intellectual property rights, continue to damage the U.S. economy as American businesses in the United States and China lose sales and jobs to competitors who do not play by the same rules and whom we have no means of persuading to address the problem. • Foreign firms doing business in China risk the loss of their intellectual property and inventory to Chinese joint venture partners because of the lax enforcement of intellectual property rights and business contracts in China. U.S. technology companies are also increasingly vulnerable to Chinese intellectual property theft and resulting lost profits and market share. • Growing Chinese investment may offer an important new source for U.S. job creation and economic growth, but it is too early to know whether the benefits will outweigh whatever longer-term economic costs Chinese state-owned and state-directed investments may bring. • Any U.S.-China bilateral investment treaty agreement can be expected to involve a lengthy negotiation process and therefore should not be viewed as a potential near-term solution for any of the many bilateral trade and investment challenges, but the potential of such an agreement should nevertheless make it an important consideration for U.S. policymakers. • The use of various emerging methodologies for measuring trade in value added may, in time, prove helpful to U.S. policymakers for crafting trade and economic policies that better exploit the U.S.’s strategic advantages, leveraging the U.S.-China trade relationship to the greater advantage of U.S. workers and businesses.